B. Thomas (Arlington, Texas, United States) on 13 February 2019 in Lifestyle & Culture. On our first day in Tahiti we flew on a very short flight over to the island of Moorea, then a few days later on to Bora Bora. 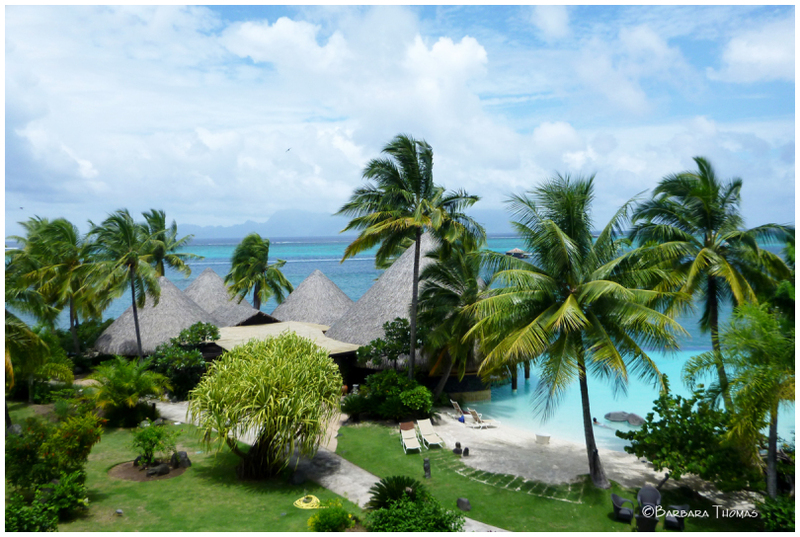 When we came back to Tahiti at the end of the trip, we could see the island of Moorea from our hotel window. *In January, 2013 I got to go on my bucket list dream trip to the French Polynesian Islands of Tahiti, Moorea, and Bora Bora. Some photos were posted here on Aminus3 at that time, but there are so many more that I never got to. This LONG series will end with the island of Tahiti, the largest of the islands that make up French Polynesia. I'm almost jealous. There looks so great. All looks so inviting ! wow...this is a lovely image !!! Fantastic image here ! Lik a picture post card !!! Wow, a wonderful place is here nicely photographed. A superb view. What a place to relax. Very beautiful with the wind in the trees . Beautiful overlook from your hotel window! The blues are so refreshing! I like everything about this image especially the color of the water way out there. Such a gorgeous view. I love the color of the water!